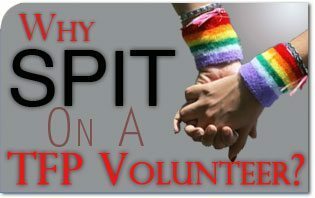 The American TFP > Fighting for our Culture > Why Did a Pro-homosexual Student Spit on TFP volunteer? 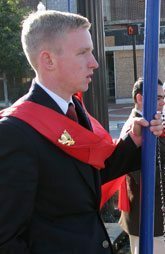 Why Did a Pro-homosexual Student Spit on TFP volunteer? As students made their way to classes on a bright Monday morning they heard the sound of bagpipes and slogans and saw TFP banners. 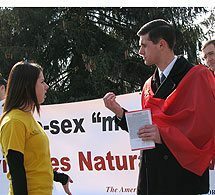 TFP Student Action members were distributing fliers encouraging students to defend traditional marriage as God made it. However, approaching TFP volunteer Peter Miller from behind, and without warning, a young woman spit on him. “She didn’t say anything to me. She just spit on me and walked away. It’s humiliating to be spit on, of course,” said Peter Miller. With the number of pro-homosexual and pro-abortion clubs that exist on secular campuses, it is not altogether surprising when one encounters contempt for the truth, especially regarding sexual morality. “You find people who hate the truth and when you defend the truth, they hate both the message and the messenger,” continued Peter Miller. “But I am not even slightly discouraged. I think of the Beatitudes and the promise Our Lord made to those who endure persecution for His sake. The truth will eventually prevail,” he said. This entry was posted in Fighting for our Culture and tagged campaign, equality, offense, persecution, peter miller, pro-family, spit, TFP, Traditional Marriage by John Ritchie. Bookmark the permalink.